John and Patrick McEnroe and Mike and Bob Bryan at James Blake's Serving for a Cure. 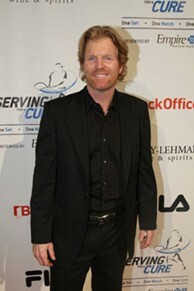 Jim Courier at Serving for a Cure in New York City. Mardy Fish at Serving for a Cure. James Blake hosted his sixth annual Serving for a Cure at Lincoln Center. NEW YORK -- James Blake had his family and his close friends with him in his hometown and, on top of it all, raised a lot of money for cancer research in just one evening. In short, it was a very successful sixth annual Serving for a Cure presented by Empire BlueCross BlueShield, which was held Tuesday, Nov. 30, at Lincoln Center in New York City. Serving for a Cure is Blake’s charity event that he established in 2005 (when it was then called Anthem Live!) in memory of his father, Thomas Blake Sr., who passed away from gastric cancer in 2004. Blake wanted to hold an event with his friends in memory of the man who was so important to him and to help raise awareness and money to help others fight the disease. The amount of support he received initially and continues to receive each year has been touching for Blake, who was joined at the event this year by his close friends and fellow tennis stars Bob and Mike Bryan and Mardy Fish, as well as former stars Jim Courier (who also served as emcee for the evening), John and Patrick McEnroe, as well as Justin Gimelstob. His mother Betty was also in attendance, as was his older brother Thomas. All proceeds from the event now benefit the Thomas Blake Sr. Memorial Cancer Research Fund at Memorial Sloan-Kettering Cancer Center in New York, which Blake established in 2008 in memory of his father. "My father meant so much to me that I knew I had to do something," Blake said of starting the event back in 2005. "I am so thankful these guys were able to come here for this event from across the country. Some of them will only be here for one night, and I am real lucky to have friends who will drop everything to come help me out." The event, while in its sixth year, had a different look to it, as no tennis was played for the first time in its history, with the logistics of finding a place to accommodate a tennis court in New York City a little challenging. Serving for a Cure moved to New York last year from Virginia, so it is now close to Blake’s hometown of Yonkers, N.Y., and where he grew up in Fairfield, Conn. This year, professionals demonstrated the growing game of ping pong instead - and Blake and friends picked up paddles as well. But no matter where or when the event takes place, Blake’s friends will be there. "It is a no brainer. We love James. Everyone in tennis loves James," Mike Bryan said. "We respect him, and we are going to help him out forever. We have done his event five or six times, and we don’t ask for anything in return. We enjoy our time at these events, and we are just hoping to help him out and raise some money." In fact, for the Bryans, the world No. 1 doubles team, this was just one stop in a long line of charity events they are doing across the country in the next few weeks, including ones hosted by Fish and Gimelstob. Bob Bryan is also getting married between events in the cross-country charity tour. It is just a few weeks before the 2011 tennis season starts, but they are happy to do it. "(After the charity events), we go to Thailand at the end of December, so our offseason is only two weeks long, but helping our friends is what we like to do," Bob Bryan said. Fish, the world No. 16, echoed his friends’ sentiments. "This is the only time we can do things like this," he said, referencing the length of the tennis season. "James has helped me a few times with my event, as have I with his, and it is nice that we are able to make it work." As the attendees watched ping pong Tuesday, they were treated to a meet-and-greet champagne reception to start the evening, with a silent auction featuring items such as autographed tennis racquets from Rafael Nadal, Venus Williams and Maria Sharapova, an autographed football from Peyton Manning, signed LIVESTRONG items from Lance Armstrong, as well as a David Yurman bracelet and a Tory Burch bag. 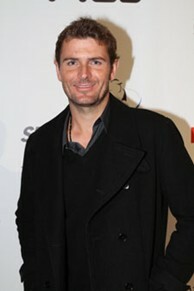 The host committee for this year also featured some of the biggest names in sports, entertainment and fashion, who pledged their support for Blake and the cause, including Michael Jordan, Billie Jean King, Sugar Ray Leonard, Andy Roddick, Pete Sampras, Susan Sarandon, Brooklyn Decker, Anna Wintour, Donna Karan and Tory Burch. In addition to the tennis stars, a few celebrities were in attendance for the event, as well, including Karan, Star Jones, Gayle King and former New York City mayor and current USTA board member David Dinkins. After the opening reception, Courier, the new U.S. Davis Cup captain, started his emcee duties, which led into a few words from Sloan Kettering doctors and sponsors, and then a live auction was held. Courier was one of the first people Blake called for this year’s Serving for a Cure and, when asked, did not hesitate in his reply. "Before he told me where and when, I said, ‘Yes, I am in,’" Courier said. "James is a great philanthropist for tennis and has donated so much of his time for other events and causes. Now in the sixth year for Serving for a Cure, I am honored to be here with James and his whole family." The live auction was hosted by wine expert Kevin Zraly, who opened the festivities by sharing his own touching story as a cancer survivor, as well as that of his now 11-year-old daughter, who was diagnosed with leukemia at age four. Attendees then had the opportunity to bid on all kinds of fantastic packages, such as one-on-one tennis lessons with Blake, including tickets to the US Open, BNP Paribas Open and Sony Ericsson Open; tickets and VIP access to concerts featuring Carlos Santana and Usher; an Ippolita bracelet; dining experiences at four of New York’s best restaurants (bid on and won by John McEnroe); a dream trip to Napa Valley; an autographed ping pong table by the tennis stars at the event; tickets and VIP access to New York’s Fashion Week, as well as straight donations to fund cancer research by young investigators. Musician Ryan Leslie then took the stage for a concert, followed by the legendary Patti LaBelle, who came straight from her Broadway show ‘Fela!.’ When she took the stage, she told of how closely she, too, has been touched by cancer, having lost three sisters to the disease before they were in their mid-40s. To close out the night, she sang a touching rendition of "Somewhere Over the Rainbow," a song filled with hope, which is something Blake is trying to give other families touched by cancer as he helps raise more and more money to find new cures and treatments as well as help early detection. "I hope (Serving for a Cure) is going to make more of a difference in fighting this disease," Blake said. "I am just so happy it keeps growing. It seems like people are being added every year who want to help in any capacity, from the host committee to volunteers. Unfortunately, it is probably for sad reasons because so many people are touched by cancer they want to help out. But if we have more events like this, hopefully they will be less necessary."